Στο περίπτερο της BMW στη Γενεύη, εκτός από το Vision ConnectedDrive βρίσκεται και το BMW ActiveE, το πρωτότυπο ηλεκτρικό όχημα που βασίζεται πάνω στην Σειρά 1 και χρησιμοποιεί έναν ηλεκτροκινητήρα 125 kW (168 ίππων) ο οποίος τροφοδοτείται από μπαταρίες ιόντων λιθίου. Οι μπαταρίες είναι τοποθετημένες κάτω από το κεντρικό τούνελ και από τα πίσω καθίσματα και ψύχονται μέσω υγρού κυκλώματος για καλύτερη απόδοση. Με μία πλήρη φόρτιση η αυτονομία του φτάνει τα 160 χλμ ενώ τα 0-100 χλμ/ώρα έρχονται σε 9 δευτερόλεπτα με την τελική ταχύτητα να περιορίζεται ηλεκτρονικά στα 145 χλμ/ώρα. Το αυτοκίνητο μετά την Γενεύη, θα κατασκευαστεί σε 1000 μονάδες στο εργοστάσιο της Λειψίας και θα διατεθεί σε Αμερική, Ευρώπη και Κίνα ώστε να ξεκινήσει τις δοκιμές αφού πολλά μέρη του θα χρησιμοποιηθούν στο ηλεκτρικό city-car i3 (Megacity όπως το γνωρίζαμε), το πρώτο αυτοκίνητο του νέου i brand της BMW) το οποίο θα αρχίσει τις πωλήσεις του το 2013 με την BMW να στοχεύει στις 30.000 πωλήσεις ετησίως με την τιμή του να κυμαίνεται γύρω στις €40.000. 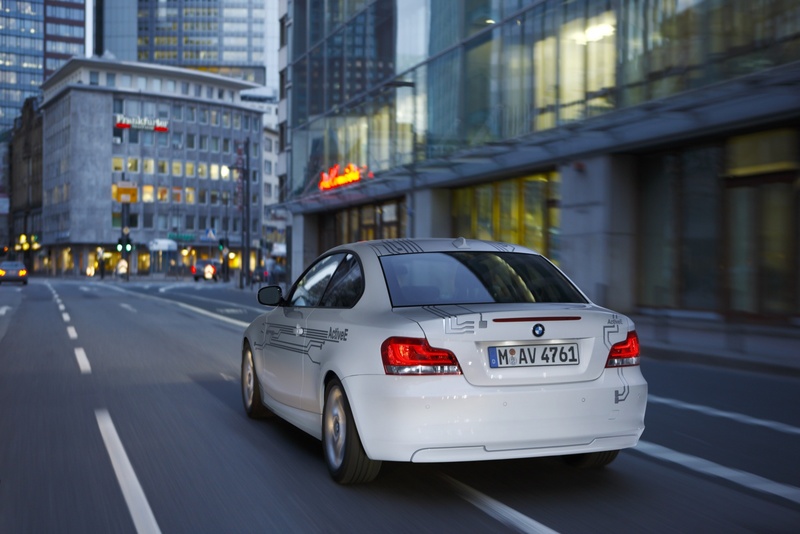 The next step towards emission-free mobility: The BMW ActiveE. MCV. With the BMW ActiveE, the future of individual mobility combining driving pleasure with CO2-free driving is one step closer. In the development of groundbreaking vehicle concepts and drive technologies within the framework of the EfficientDynamics strategy, the BMW Group attaches key importance to electric mobility. With EfficientDynamics the BMW Group has for some time now been very successful in reducing fuel consumption and emission levels through new and highly-efficient engine generations, enhancement of aerodynamics, the use of innovative lightweight construction and intelligent engine management – and with better performance into the bargain. 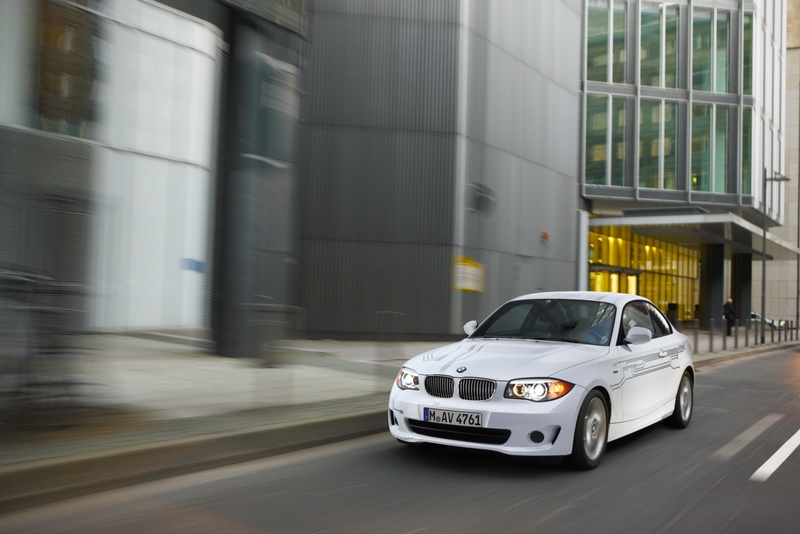 For instance, CO2 emissions of the entire vehicle fleet were reduced by around one third in the years 1995 to 2009. Thanks to EfficientDynamics, the company is now able to realise additional economy advantages through the further electrification of the drive train and hybridisation. In the medium term, the BMW Group is developing vehicle concepts for emission-free mobility in larger urban areas. In the long term, EfficientDynamics means the transition to emission-free mobility – using both battery power and regeneratively produced hydrogen. 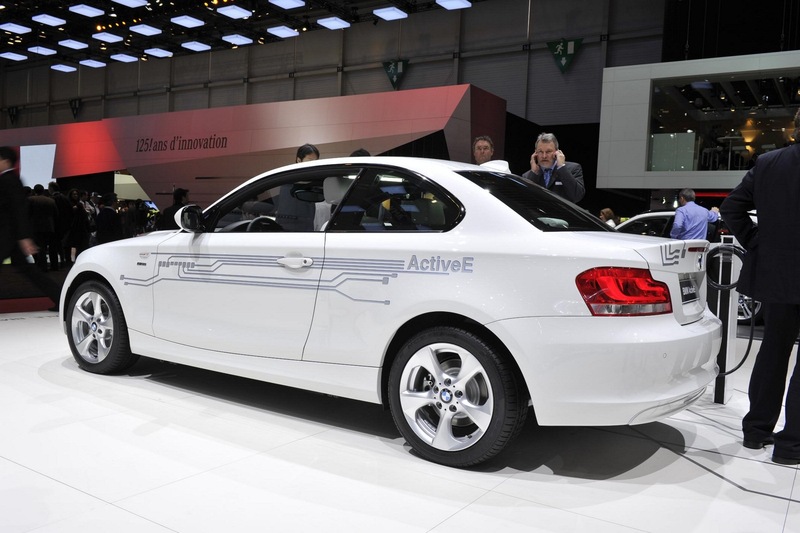 On the way to sustainable, CO2-free mobility, the BMW Group now presents the next major milestone – the BMW ActiveE. 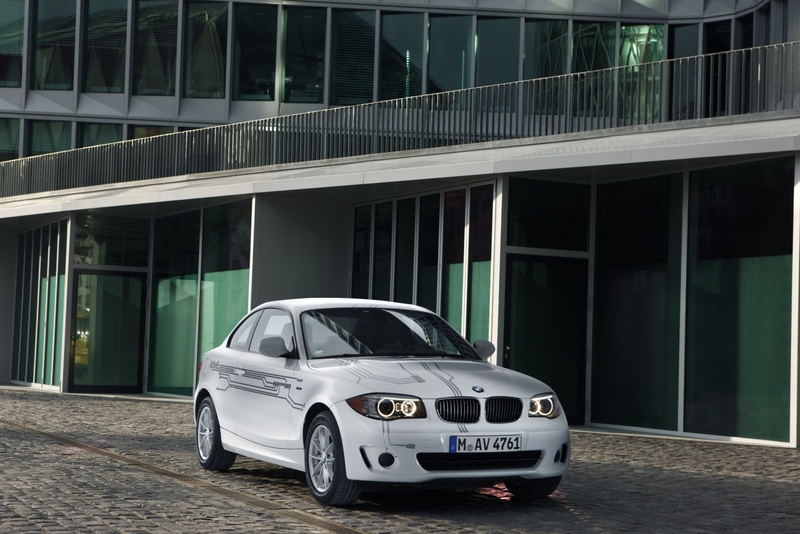 Following the MINI E, the BMW ActiveE is the BMW Group’s second electric prototype. With a power output of 125 kW/170 bhp and maximum torque of 250 Nm, the car accelerates from 0 to 100 km/h in 9 seconds, demonstrating the dynamic and agile characteristics of a BMW, and as is typical of electric vehicles, straight from a standstill. At the same time, newly conceived lithium-ion energy storage units facilitate a vehicle range of around 160 kilometres (100 miles) in everyday operation. electric vehicle to offer four fully-fledged seats and a 200-litre luggage compartment. 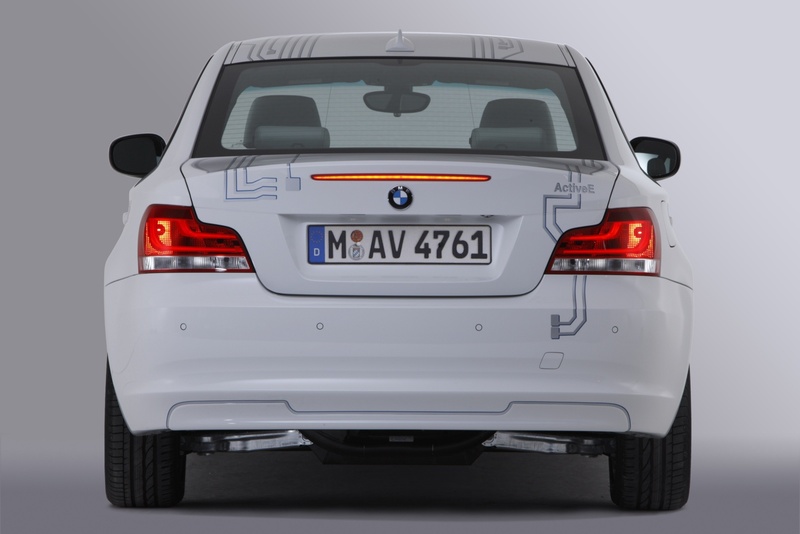 This achievement by BMW developers is even more impressive in terms of the vehicle’s role during the initial testing phase. 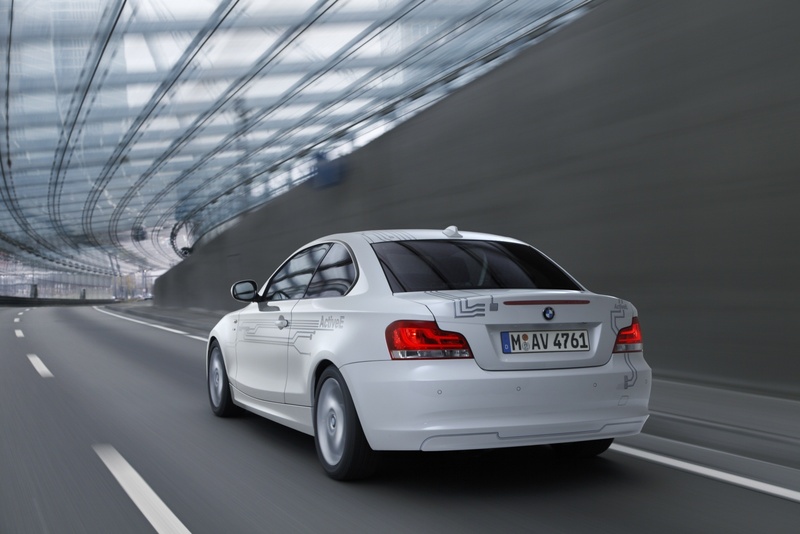 The BMW ActiveE incorporates a pilot series version of the drive train and energy storage unit from the MCV with a partly identical, partly similar geometry in a vehicle from a different concept so that these components may undergo preliminary testing. However, except for a small scoop in the bonnet and a smaller boot, the exterior and the interior design is virtually the same as that of the series production vehicle. Intelligent utilisation of construction space to ensure optimal functionality. 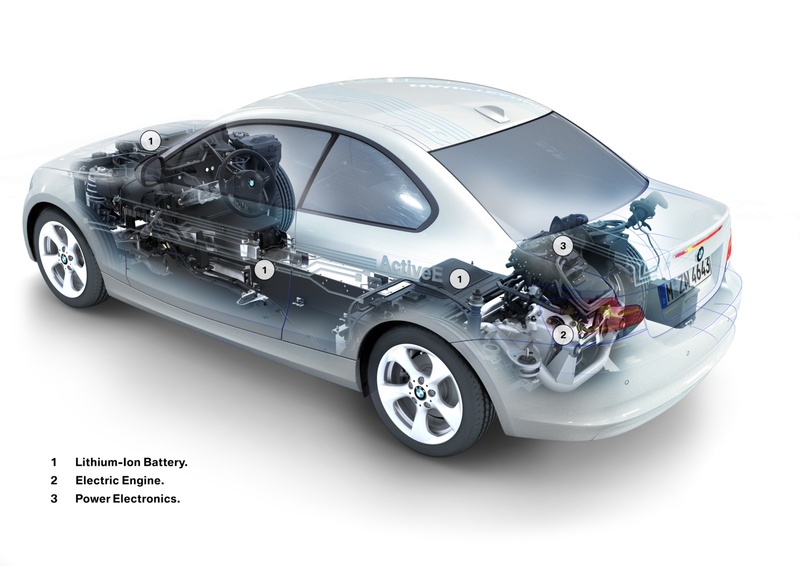 The BMW ActiveE is equipped with three large energy storage units that are positioned in the area where the engine block, power transmission to the rear wheels and the tank are to be found in a vehicle with a combustion engine. The drive train of the BMW ActiveE – i.e. the electric motor with gear and power electronics – directly on the rear axle in order to save space. 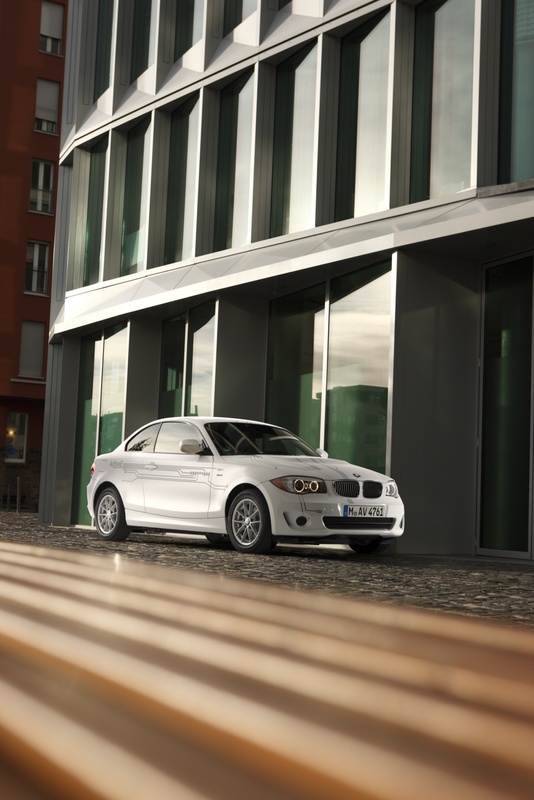 Thanks to this measure, the BMW ActiveE corresponds to a conventional BMW 1 Series Coupe with regard to available interior space. Driver and front-seat passenger as well as passengers at the rear have the same amount of space at their disposal as in the BMW 1 Series Coupe and do not have to suffer any disadvantages at all with regard to headroom, legroom or shoulder room. This is due to the ideal positioning of the power electronics, which are located for functional reasons above the rear-axle mounted electric motor. With a volume of 200 litres, the boot offers sufficient space for bottle crates or two 46-inch golf bags. Crash safety has top priority. large energy storage units located at the front end as well as the tunnel and tank could not be damaged or destroyed. The front end: crash structure and energy storage units instead of a combustion engine. 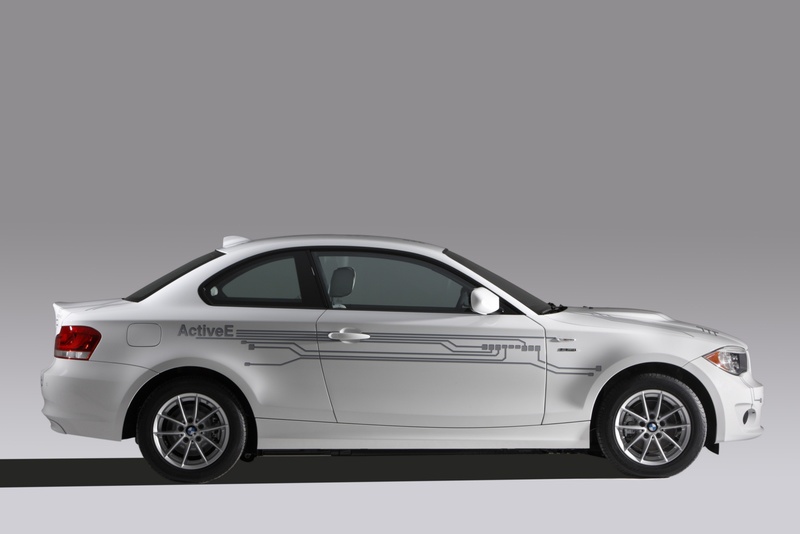 In order to achieve the best possible range, the BMW ActiveE is the first limited production electric vehicle in which part of the high voltage storage units is integrated into the front end of the vehicle at the cowl. There, one of the three energy storage units of the BMW ActiveE takes up around half of the construction space normally occupied by the combustion engine. Extensive measures implemented in this area guarantee optimal passenger safety in the event of a crash and also ensure that the high-voltage storage unit, ancillary components and battery fluid containers remain undamaged. 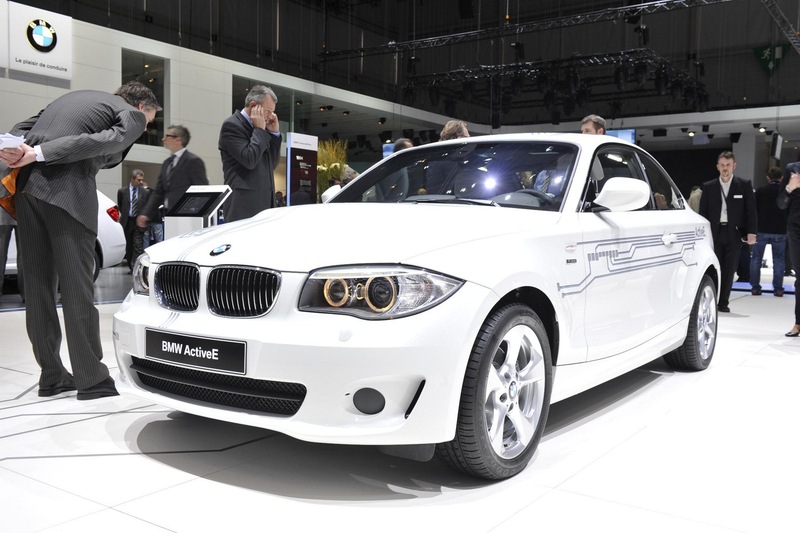 Hence the BMW ActiveE meets the same high safety standards as a BMW 1 Series with combustion engine, fulfilling not only crash safety requirements stipulated by the government, but also the stringent BMW corporate demands on passive safety, some of which are even higher than those required by law. Construction space measures and weight optimisation. In addition to passenger crash safety, BMW Group engineers focused in particular on the integration of the required battery capacity without having to compromise on interior space. Many of the well-thought-out solutions are to be found in the details. For example, a modified tunnel housing in the undercarriage facilitates a larger tunnel volume without reducing the amount of space available to passengers. In another area, a slightly modified centre console angle provides more construction space resulting in increased battery capacity. weight reduction within the framework of a conversion concept. However, weight-optimised electric mobility can only be demonstrated in the form of a purpose-built car such as the MCV, as it is ideally adapted to the conditions and requirements of electric mobility. 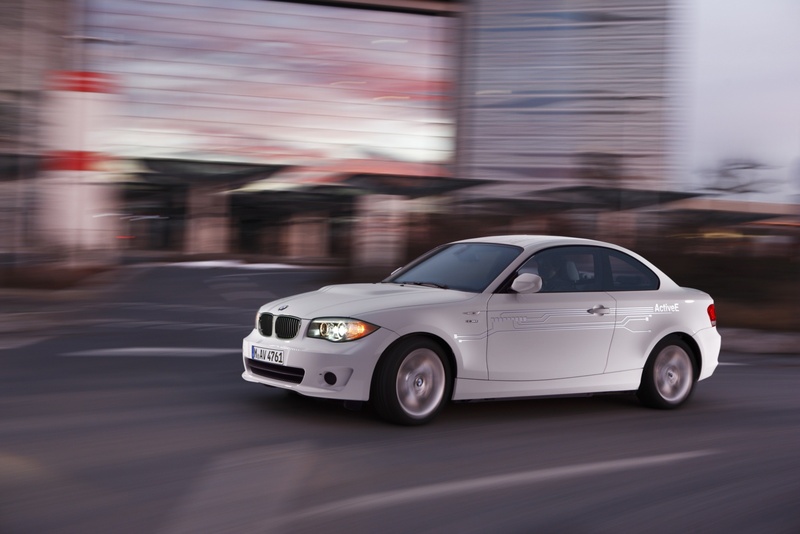 The BMW ActiveE is based on the BMW compact-class model known for its outstanding agility and efficiency – the BMW 1 Series Coupe. With its powerful-looking proportions, the BMW ActiveE stands for compact agility, the convex-concave design vocabulary giving the vehicle an even more dynamic appearance. However, specific visual interior and exterior accents give indication of the exceptional character of the purely electrically powered BMW. Silver coloured, circuit-inspired graphic elements on an Electric Blue background run over the entire Alpine White car body. The intentional asymmetry of the graphic elements gives the vehicle a uniquely distinctive and agile appearance, the blue shadowing providing additional depth. 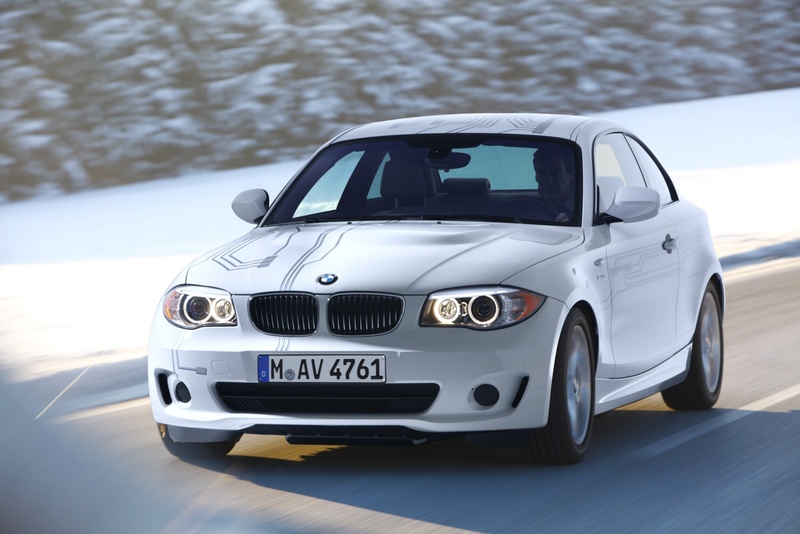 Furthermore, the flowing design of the scoop in the bonnet differentiates the exterior design of the BMW ActiveE from a conventional BMW 1 Series Coupe. It provides space for the energy storage unit located beneath it. 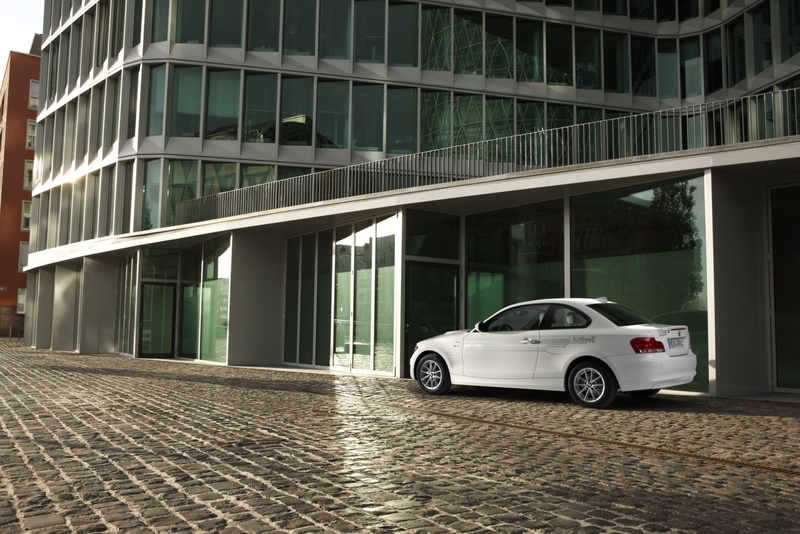 The completely closed rear apron is a distinctive feature of the BMW ActiveE. As the ActiveE does not have a combustion engine, there is no need for tailpipes and an exhaust system. Where the tailpipes are normally located, the BMW ActiveE boasts a silver-blue accentuating trim in the completely closed rear apron that indicates that the vehicle is free of emissions. 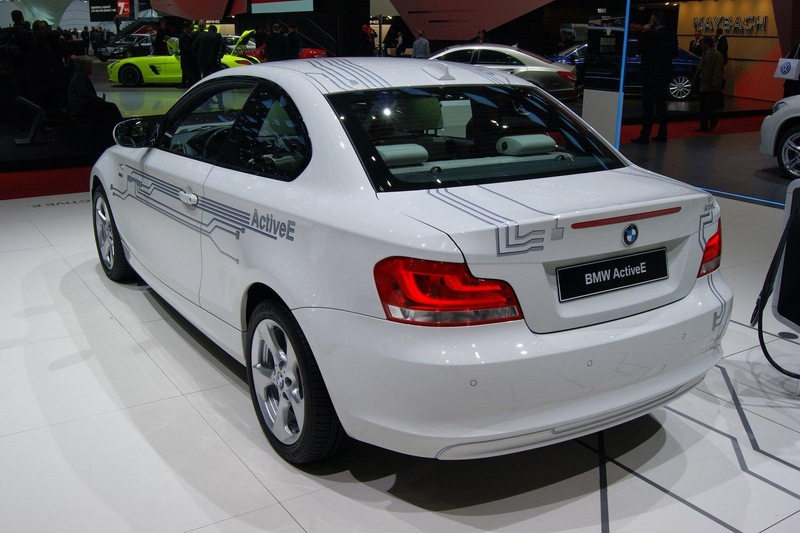 Further differentiating features are the logo “ActiveE” on the back of the car and the “eDrive” logos on the side panels as well as the high-quality chrome kidney grille. In order to increase the vehicle’s range even further, the BMW ActiveE rides on wheels of the latest generation of tyres with optimised rolling resistance. This results in a rolling resistance that is up to twenty percent lower compared to previous series production tyres. The wheels of the BMW ActiveE are complemented with by far the lightest 16-inch alloys by BMW and boast a double V-spoke design. A more sporty 17-inch aero wheel rim with a five-spoke design is also available. In the interior the features of a BMW 1 Series Coupe are also combined with individual details that emphasise the unique BMW ActiveE concept. Blue contrasting seams accentuate the Dakota Leather seats in exclusive Pearl Grey. Dashboard and door linings are fitted with interior trim in Alpine White, which is available for the first time, and sport a high-quality “ActiveE” appliqué that transfers the exterior graphics into the interior of the car. The shift lever plaque in black and blue complements the overall graphic concept. 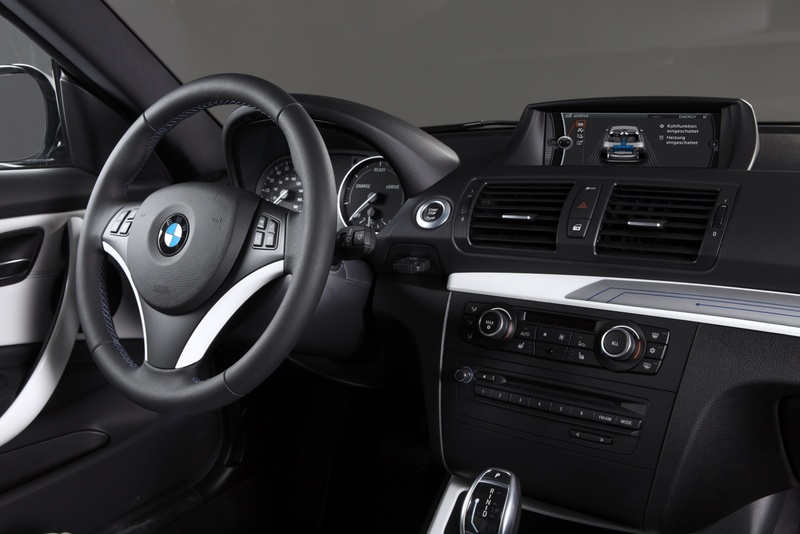 The instrument cluster und the control system iDrive were adapted to the electric drive concept of the BMW ActiveE and enhanced by specific display functions. Instead of indicating the engine speed, the instrument on the right of the cluster shows the amount of energy being taken from the battery or the current amount being supplied to it through recuperation. 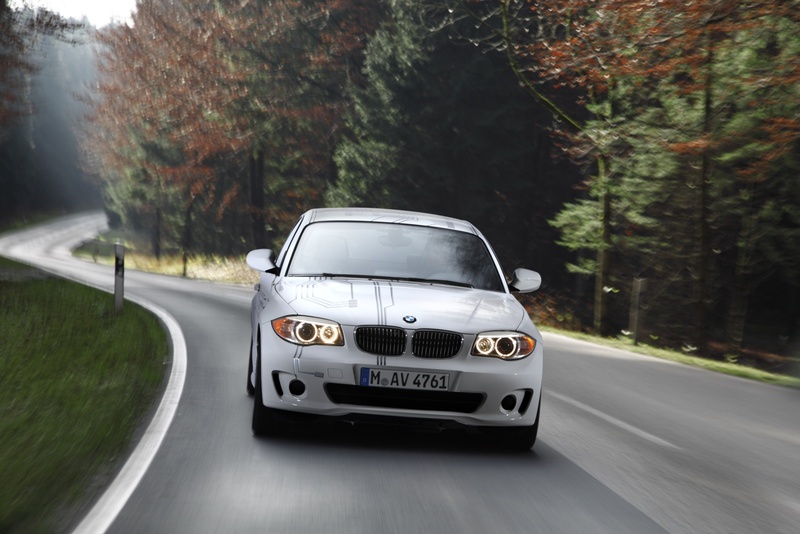 When the vehicle is at a standstill, the middle position of the needle indicates that the vehicle is ready to drive, as the BMW ActiveE has no engine sound to inform the driver whether or not the engine is ready to be started. If the vehicle is not ready to drive, the needle rests at the bottom left of the instrument. The “fuel gauge” below it indicates the battery charge level. Furthermore, the onboard computer provides additional vital information such as the remaining vehicle range, for example. The eDrive display functions on the Central Information Display depict vehicle energy flows to make electric mobility even more perceptible and comprehensible. During the journey an active schematic representation of the vehicle informs the driver whether energy is currently being taken from the battery or being fed in to it via recuperation. Moreover, the driver can see the current charge state of the battery and also check whether the air conditioning or the heating system is working. This representation can, if required, also be shown as a spilt screen to allow the simultaneous display of additional infotainment contents or the route guidance of the navigation system. 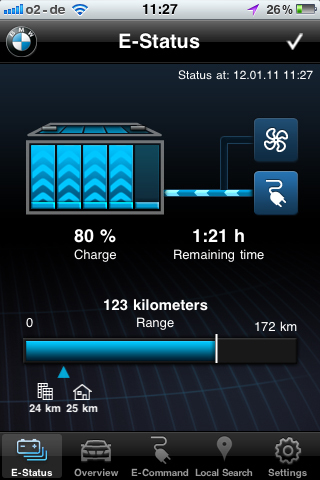 When the vehicle is at a standstill, it is also possible to see on the display whether the vehicle is currently being charged or whether the battery and interior are being conditioned. 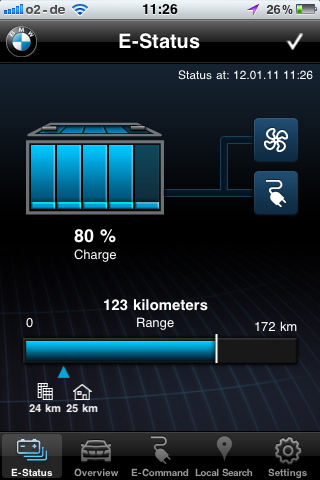 In addition, a special battery information menu provides information on the battery energy level as well as the current and remaining vehicle range. During charging it also indicates the remaining charging time. If the driver wishes to increase the range of the BMW ActiveE even further, it is now possible to do this via the ECO PRO Mode. As soon as the driver activates the switch on the centre console, the vehicle’s drive configuration and comfort functions are modified to facilitate an even more efficient driving style. Due to an adapted accelerator pedal characteristic, less power is demanded in the ECO PRO Mode than in the normal driving mode, but with the same pedal travel. Also, the heating and cooling characteristics of the heating and air conditioning systems have a flatter setting and therefore use less energy. The driver is also provided with tips on how to reduce energy consumption even further for the best possible motoring efficiency. 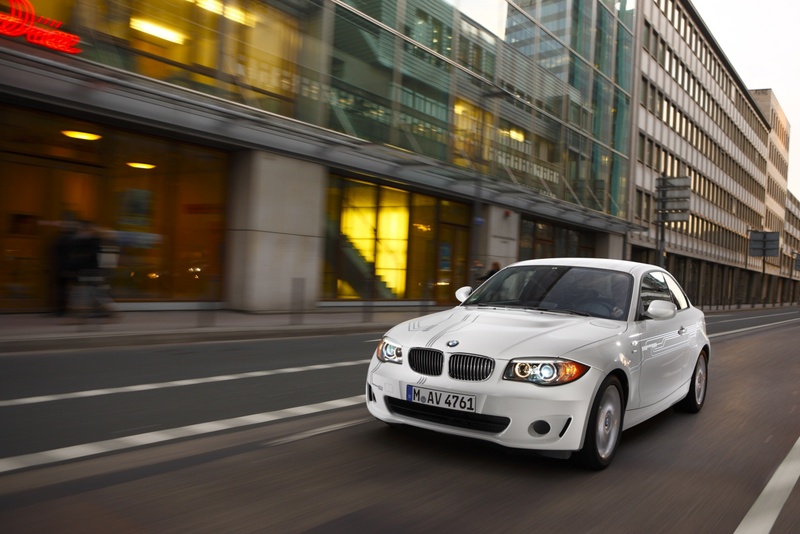 The BMW ActiveE represents typical BMW driving pleasure in a new, emission-free form. 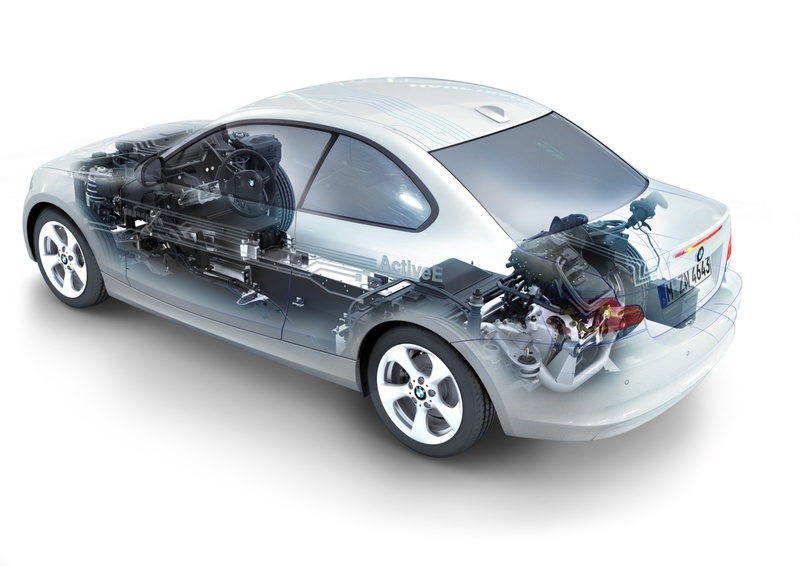 The heart of the BMW ActiveE is the powerful electric synchronous motor, the components of which were designed with the requirements of the MCV in mind and which are now being tested in a pilot production series. Maximum power output of the electric drive system is 125 kW/170 bhp. Maximum torque of 250 Nm is – as is typical of electric vehicles – available from a standstill and, for the first time, remains utilisable across an exceptionally broad load range. As a result, the BMW ActiveE accelerates from 0 to 100 km/h in just 9 seconds, the 60 km mark being reached in less than 4.5 seconds. 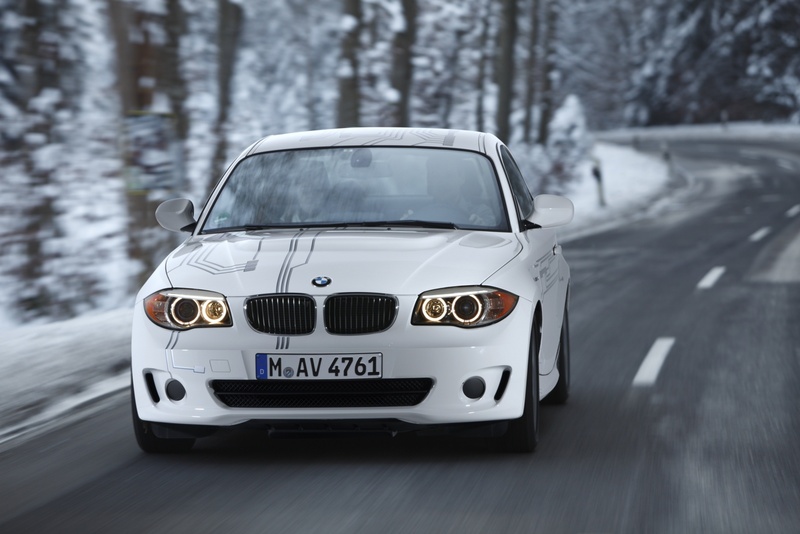 Top speed is electronically limited at around 145 km/h (90 mph). 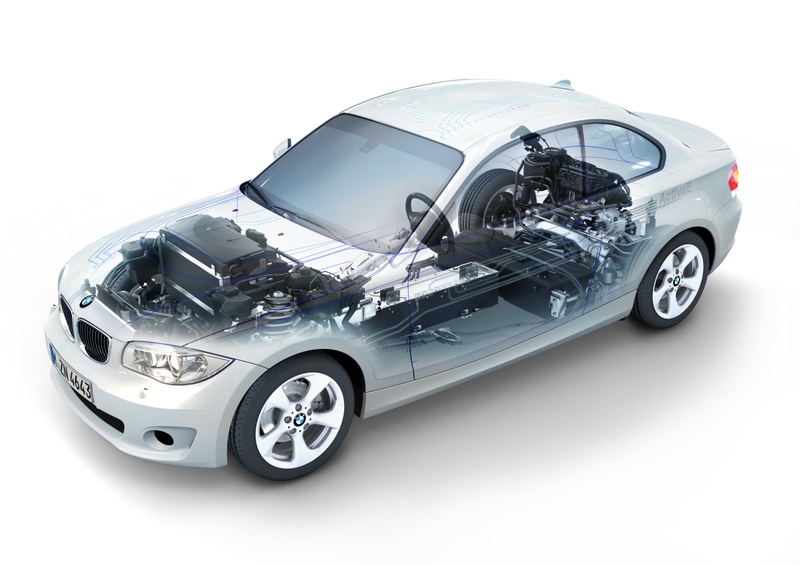 The permanent-magnet hybrid synchronous motor and the power electronics of the BMW ActiveE were developed entirely in-house and are characterised in this combination by exceptional efficiency, optimised power development and a compact design. The innovative character of the electric drive system is reflected above all in the relation between engine output and space requirement. 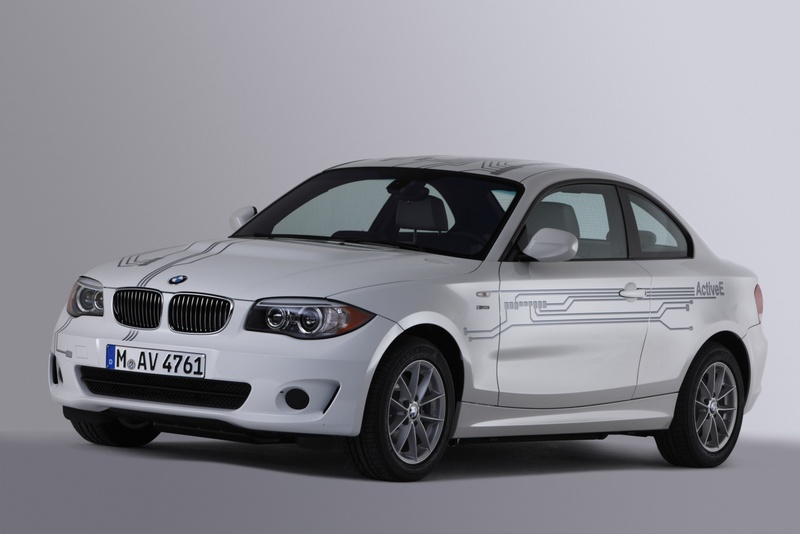 The entire power pack including power electronics and transmission with differential is integrated into the modified rear-axle support of the BMW ActiveE, and with a 125 kW output, still has a total weight that falls below 100 kilograms. Drive and slow down with the accelerator pedal. Not only does the spontaneous response enhance the intensive driving experience in the BMW ActiveE, but also the possibility to slow down using the accelerator pedal. When the driver takes his or her foot off the pedal, the electric motor assumes the function of a generator that feeds the electricity gained from kinetic energy back into the vehicle battery. At the same time, braking torque is created, which effectively slows the vehicle down. In this way, the accelerator pedal becomes a “drive pedal”. In urban traffic around 75 percent of all deceleration processes can be performed without using the brake pedal. Intensive use of this so-called recuperation of energy via the motor also results in a range increase of up to 20 percent. Only when the driver wishes to slow the vehicle down faster by stepping on the brake pedal does the conventional braking system of the BMW ActiveE additionally intervene. Unlike the MINI E, the BMW ActiveE features a distinctive “intermediate position” of the accelerator pedal, allowing the vehicle to “glide”. As a result, the vehicle does not immediately recuperate when the driver decelerates, but “de-clutches” using the electric motor’s zero momentum control, thereby utilising its own kinetic energy to move forward. 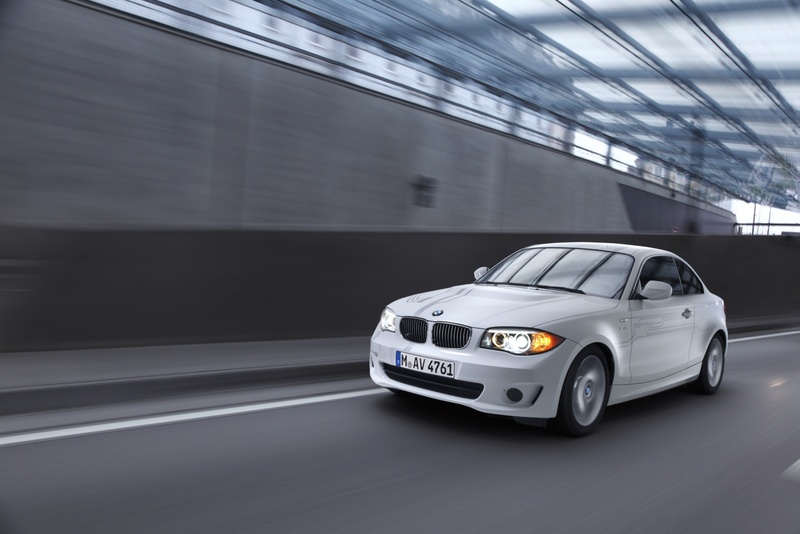 The BMW ActiveE then “glides” along the road without using energy. 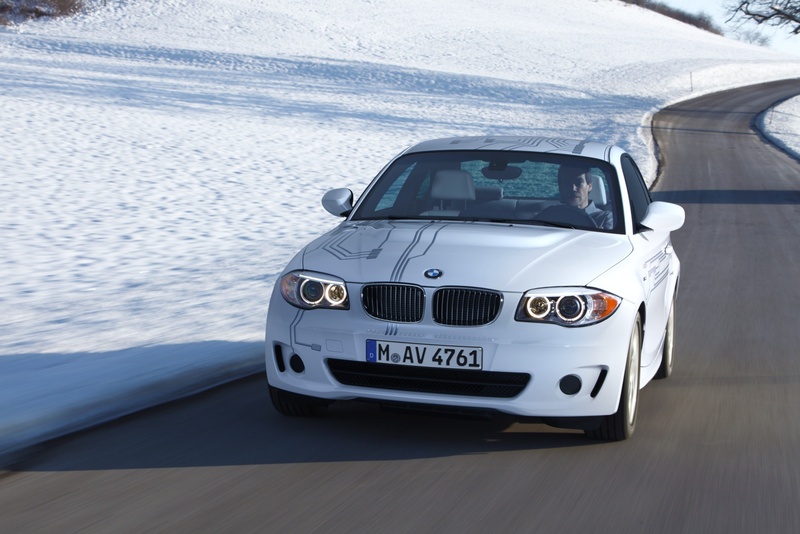 In addition to foresighted driving, gliding offers a most convenient way of increasing the vehicle’s range. A further result of the modification of the accelerator pedal characteristic curve is a significantly more precise pedal response and there are virtually no noticeable load changes. level to each driving situation, combining the highest level of recuperation with best possible vehicle stability when decelerating in any situation. Should a situation arise that is critical for vehicle stability when using recuperative or hydraulic brakes, the optimised DSC function ensures constant vehicle stability by means of targeted intervention into the braking system and engine management. Furthermore, the ASC system ensures that the rear wheels are able to transfer the high torque of the electric drive into maximum propulsion when starting off. Well-adjusted: the lithium-ion storage unit with its own liquid cooling system. 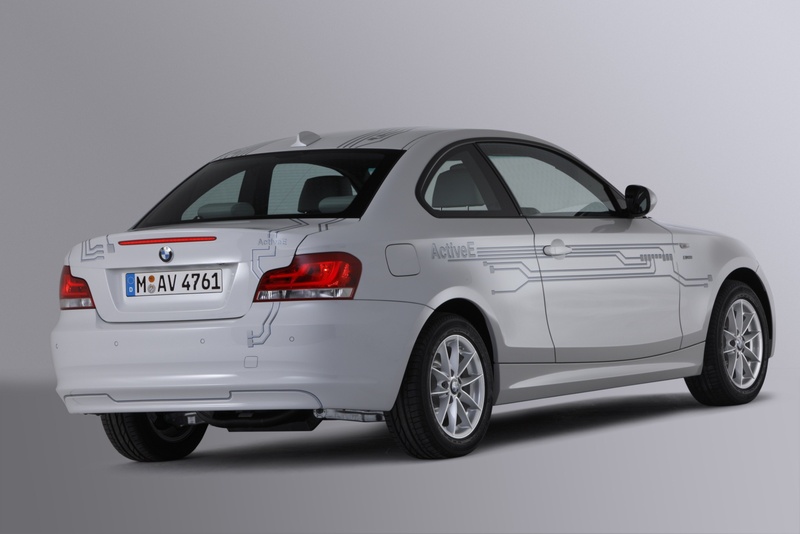 Specially developed lithium-ion storage cells ensure the energy supply of the drive system and all further functions of the BMW ActiveE. These high-voltage battery units excel above all through their high storage capacity. 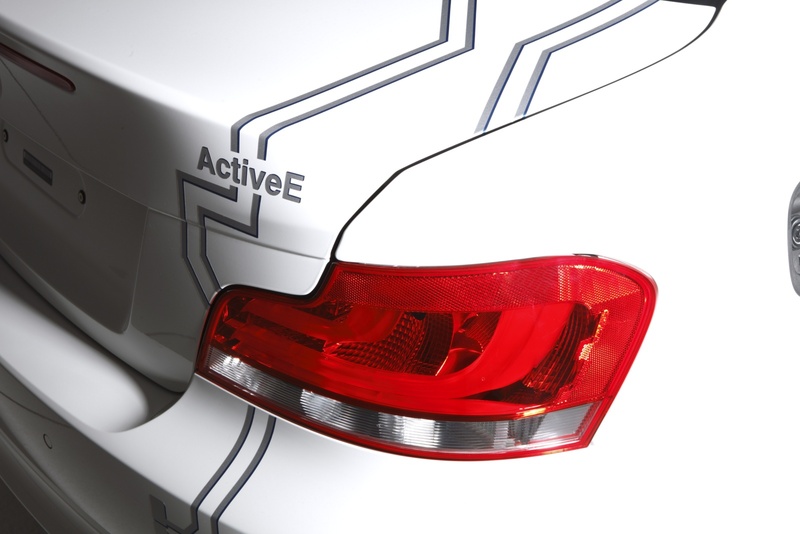 The BMW ActiveE features storage cells, which are being used for the first time and were jointly developed by the BMW Group and its associate partner SB LiMotive exclusively for automotive use. The technological competence of the cooperation partner SB LiMotive ensures that the high storage capacity and cycle stability of the lithium-ion batteries are also guaranteed under the exceptional conditions of automotive use and the associated demands with regard to lifespan, operational stability and safety. 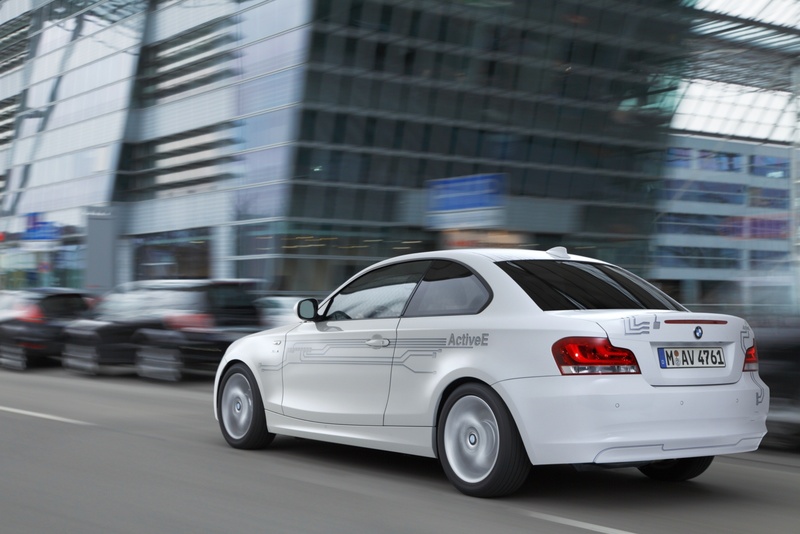 With the BMW ActiveE developers are testing the storage cells and the storage electronics, which are to be installed later in the MCV. Combined into modules of six, eight or ten storage cells, they fit literally perfectly into the available construction space in the BMW ActiveE. 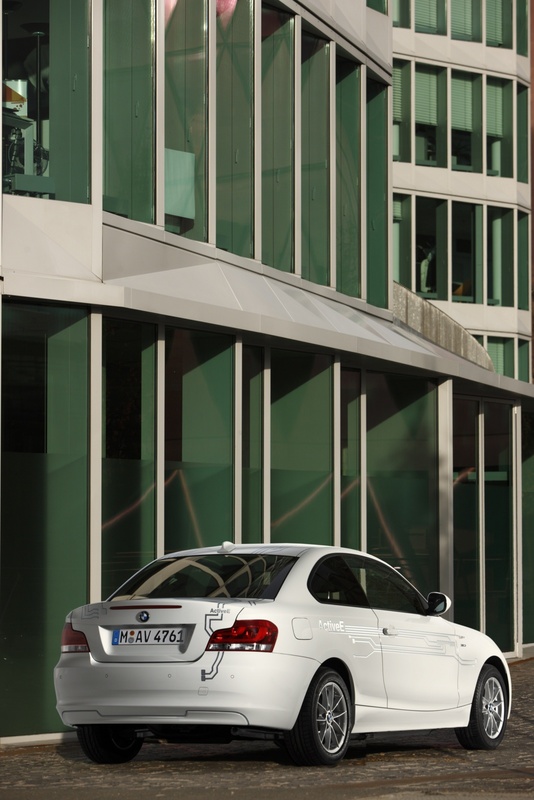 Construction space, which is reserved in vehicles featuring a combustion engine for components the electrically powered BMW 1 Series Coupe does not require, is intelligently utilised. The large battery unit of the BMW ActiveE takes up the space in the lower area of the vehicle normally intended for the conventional drive train. In order to accommodate additional storage cells, the space at the rear that has become available through the omission of a fuel tank is utilised. Further lithium-ion cells are located at the front end in front of the cowl. temperature of the energy storage units, thereby significantly contributing towards an increase in the service capability and lifespan of the battery cells. The air conditioning/heating system tempers the liquid running through the storage unit housing via a heat exchanger. If necessary, the liquid can also be heated in order to bring the energy storage units up to the ideal temperature of approximately 20° Celsius even during the winter. Thanks to these measures, the BMW ActiveE achieves a range of around 160 kilometres (100 miles) with a full battery charge and auxiliary consumers switched on. According to the American consumption cycle FTP72, the vehicle has a range of up to 240 kilometres (150 miles). 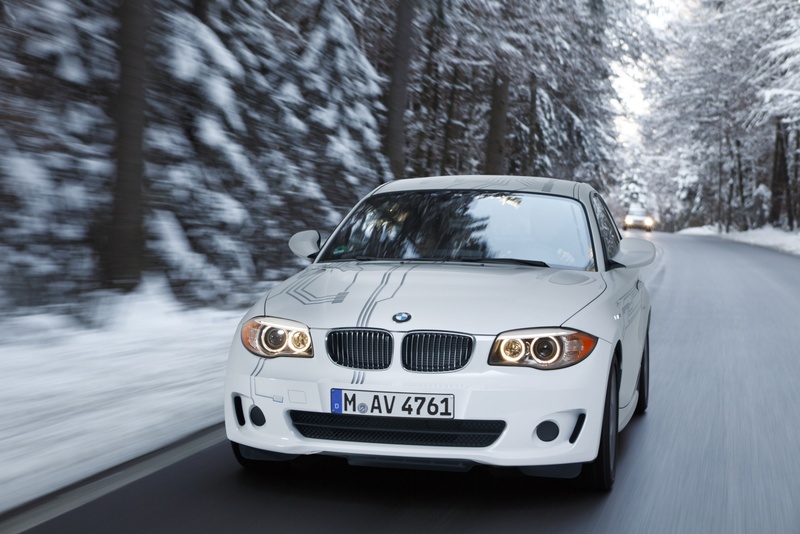 Intelligent battery management especially developed for the BMW ActiveE ensures that this range can be achieved as far as possible independently of external climatic conditions. Fast and flexible retrieval of fresh energy. The consistent development of electrically driven series production vehicles also encompasses innovative solutions for flexible, convenient and user-friendly charging of the vehicle’s energy storage systems. The lithium-ion battery units featured in the BMW ActiveE can be supplied with fresh energy from the most diverse external power sources. The vehicle is not dependent on a specific battery charging terminal and, depending on availability, electricity of varying current strength can be fed into the storage unit. The respective transformation is guaranteed by the integrated, highly efficient comfort battery charger. As a result the driver has a significantly higher degree of flexibility. 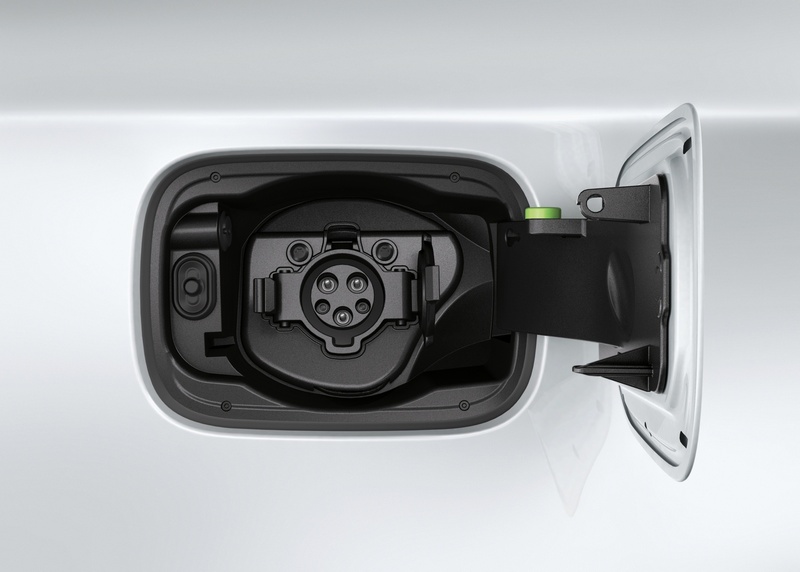 In addition to using the so-called wallbox, a 32-ampere power supply terminal, installed at the user’s home and optimised to obtain the shortest possible charging times, the driver can also connect the vehicle to a conventional power socket or a publicly accessible charging station. The standardised US plug SAE1772 on the vehicle constantly ensures unvarying access to the charging point and special battery charger leads with corresponding standardised adapters ensure trouble-free connection in every country in which the system is available. just a one-hour charge at the wallbox. Using a conventional socket in Europe, the energy storage unit is fully charged over night. 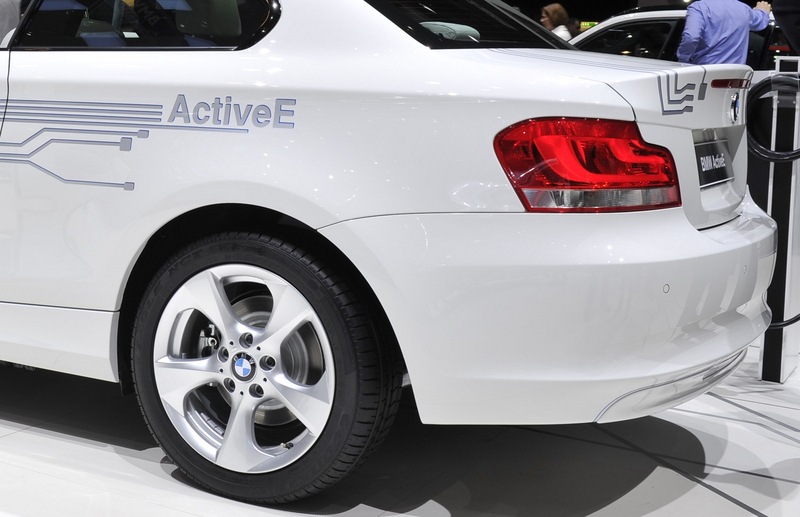 The BMW ActiveE’s power electronics developed by BMW regulate the required strength and voltage of the supply of electricity to the electric motor. They ensure full utilisation of the drive system’s full dynamic potential. Only the correct power supply to the aggregate will release the high output and guarantee homogeneous development of power. As in the future MCV, the BMW ActiveE’s power electronics are located above the rear axle on the electric motor, forming a complete unit together with the aggregate. Apart from controlling the electric motor, the power electronics also ensure the power supply to the onboard electrical systems. With the aid of a voltage transformer and incorporating intelligent battery management, they ensure the reliable supply of electricity to all vehicle functions including the comfort and infotainment features. Central control functions, which are integrated into both the power electronics as well as the energy storage system, permanently monitor all components. The driver is immediately informed of any possible malfunctions, in the event of which the system is automatically secured and switched off if necessary. 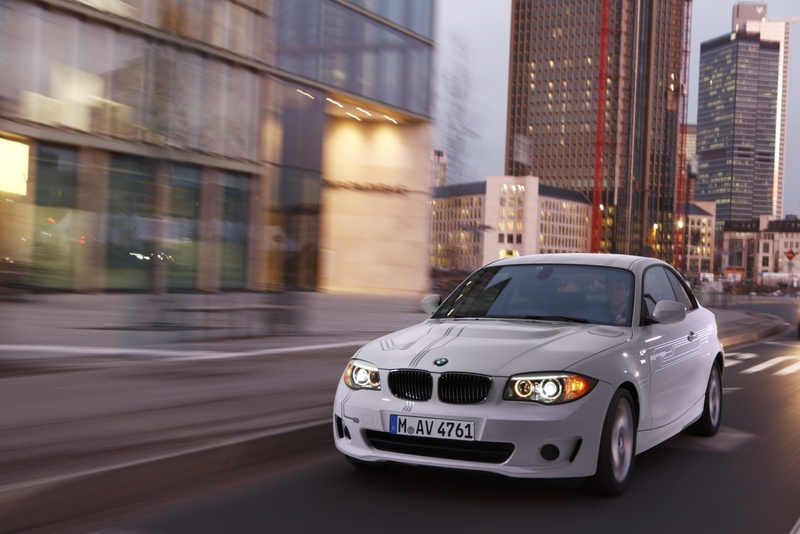 The performance of the drive system in the BMW ActiveE is typical of a BMW. The exceptional dynamics, agility and efficiency are the result of intensive development efforts. With the exception of the storage cell, BMW Group engineers develop everything that constitutes an electric vehicle – the energy storage module and its wiring, the electric motor, the power electronics and the transmission. After all, the BMW Group wishes to continue upholding its claim to producing the world’s best drive systems – drive systems that stand out from the competition through efficiency, performance and running smoothness, even when electric power and not fuel is being transformed into movement. The harmonious interaction between drive train and power electronics, road performance and range demonstrate the BMW Group’s high degree of competence in this field. 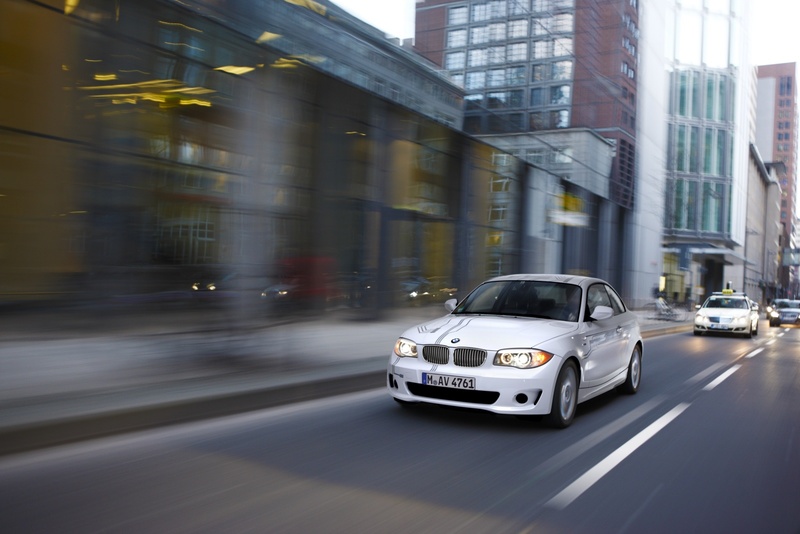 On the road, the BMW ActiveE offers the typical BMW driving experience. 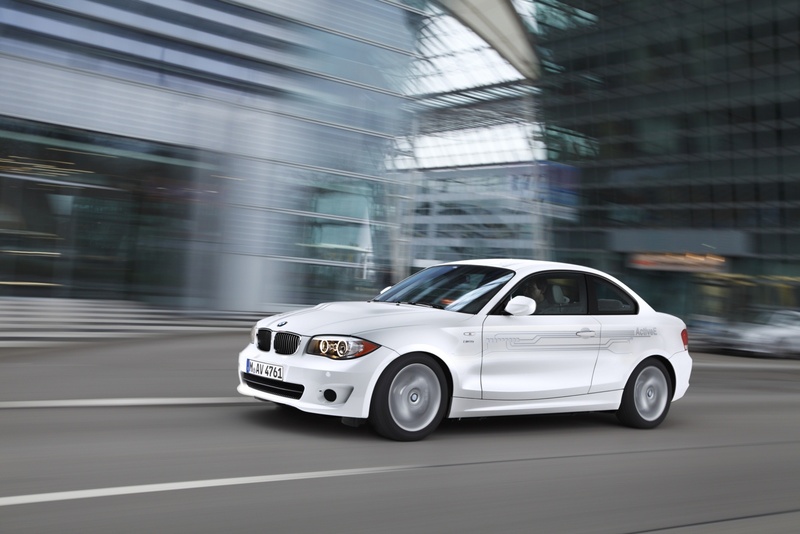 Weighing a total of approximately 1,800 kilograms, the coherent overall concept comprising drive train, handling characteristics and package guarantee the familiar supreme and agile road performance of a BMW 1 Series Coupe. The positioning of the energy storage units results in a beneficial lowering of the vehicle’s centre of gravity. Moreover, the flexible distribution of the storage units facilitates the well-balanced 50:50 axle load distribution so typical of BMW automobiles. Thanks to the dynamic wheel load shift, more weight bears down on the drive wheels, facilitating enhanced traction and power transfer of the high torque. 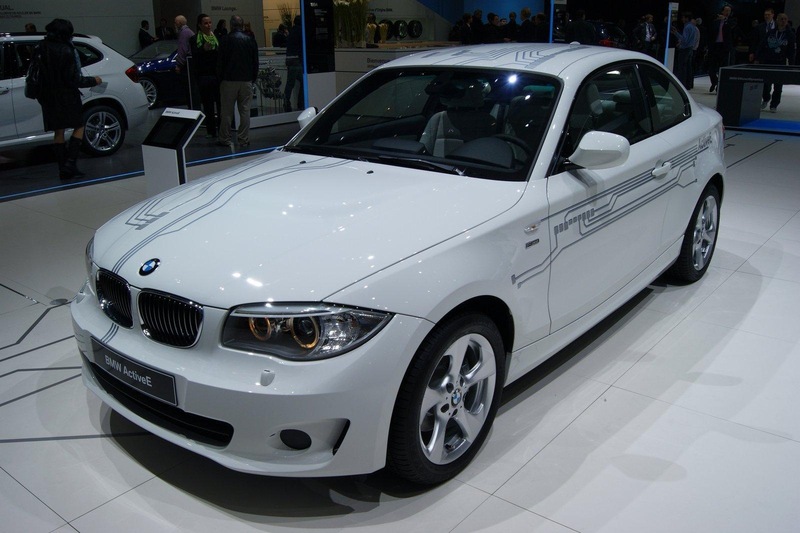 In addition to the adaptation of the rear axle to accommodate the electric drive, the BMW ActiveE’s suspension-related modifications are mainly restricted to components. 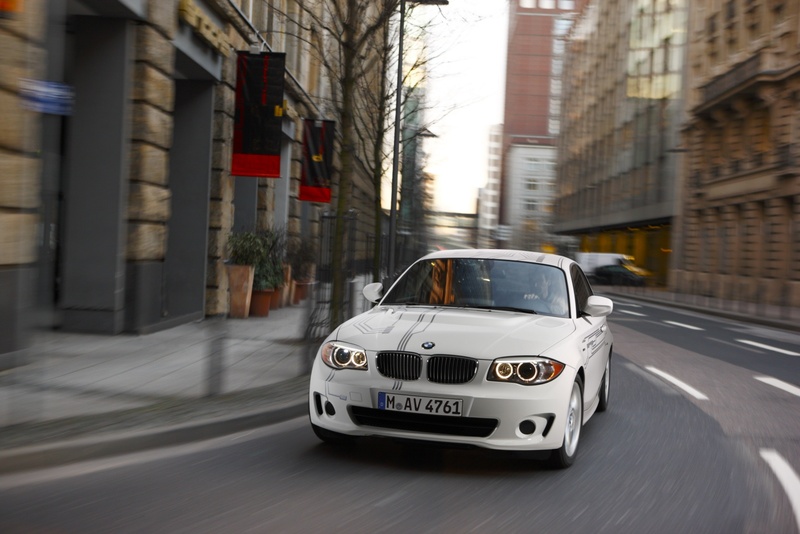 For example, steering characteristics, springs and dampers are adapted to the higher weight in comparison to the series production version in order to reproduce typical BMW 1 Series handling in combination with the electric drive train. 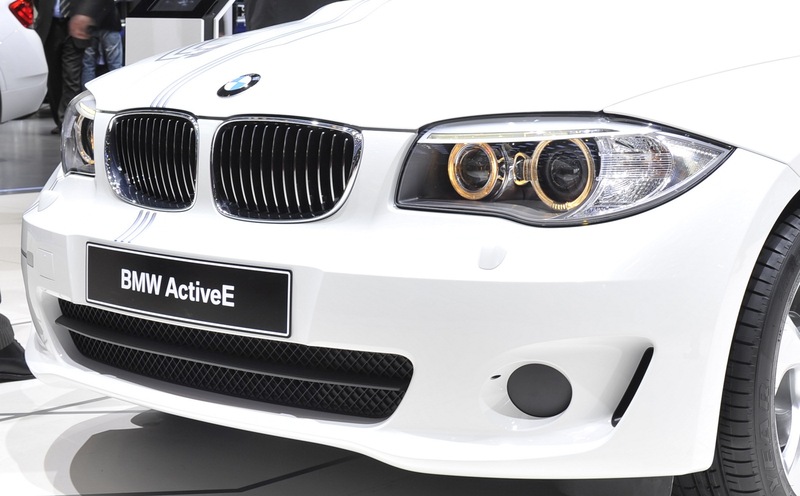 The suspension setting was chosen with a special focus on comfortable and superior driving in cities and the urban environment for which the BMW ActiveE is predominantly designed. 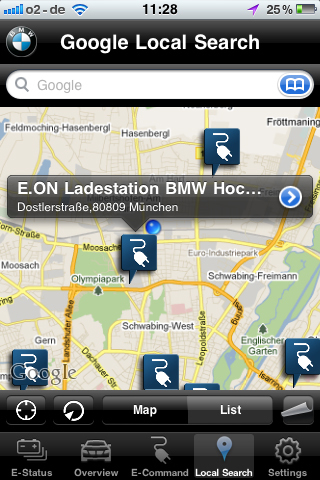 With BMW MyRemote, BMW enables the user to access the extensive range of BMW ConnectedDrive functions via an app for the Apple iPhone (from 3G) and the iPad. The user has at his or her disposal all BMW ConnectedDrive remote functions using the CE device such as locking and unlocking the doors, the activation of the horn or headlamp flasher for locating the vehicle within sighting or hearing range, the CarFinder for locating the car within a radius of up to 1,000 metres as well as the Google Local Search function. between remote controlled services and electric mobility is unique. However, prerequisite for all remote functions is that both the vehicle and the user are receiving a signal. Of course, the driver has access to the BMW ConnectedDrive functions without using an iPhone. This serves solely as a remote control and information device. The specific electric car functions – eCommand in short – comprise both charge control and control of the preconditioning of the energy storage unit and with it the air conditioning of the interior. The charge control function allows the user to start and finish the charging process as well as the setting of the charge starting time via the charge timer inside the vehicle. Via charge control the user can view the charge level at any time and see whether the vehicle is currently being charged. Users are informed of the battery charge level (SoC – State of Charge), the vehicle’s current travel range with a full battery charge and the time remaining until the batteries are fully charged. A further display function informs users how far away they are from work or the destination that has been predefined as their home, so that they are able to make a best possible estimation of the distance they are still able to travel. Moreover, the app informs users where the nearest battery charging stations are, offering at the same time the possibility to add these directly to the navigation system’s routing function as an interim destination. Unlike the MINI E, the BMW ActiveE offers the user for the first time the possibility to cool or heat both the energy storage unit and the car interior using intelligent preconditioning, thus bringing them up to the ideal operating temperature even before setting off. A preconditioned vehicle offers two advantages: firstly, the ideal operating temperature of the energy storage unit guarantees highest possible power output and hence a longer range. Secondly, the interior is already adjusted to a pleasant temperature prior to starting a journey – both in the summer and the winter. Intelligent preconditioning of the BMW ActiveE automatically determines according to the ambient temperature to what extent the vehicle and the battery should be pre-cooled or heated. Preconditioning can be activated directly or the user can determine via the timer when preconditioning should start. For instance, he or she can ensure that the vehicle is pre-cooled or heated in the mornings before they use the car. 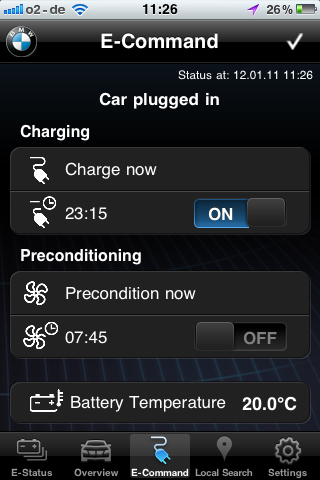 However, it is only possible to precondition the car if it is connected to a charging terminal via a battery charging lead. This ensures that the vehicle’s range is not shortened due to the comfort function. On the contrary, it actually increases it. Due to the heating and cooling process while the vehicle is connected to the power supply, the energy required for this is no longer drawn from the battery during the journey. Charging and preconditioning functions are, of course, also directly accessible and controllable from inside the vehicle. 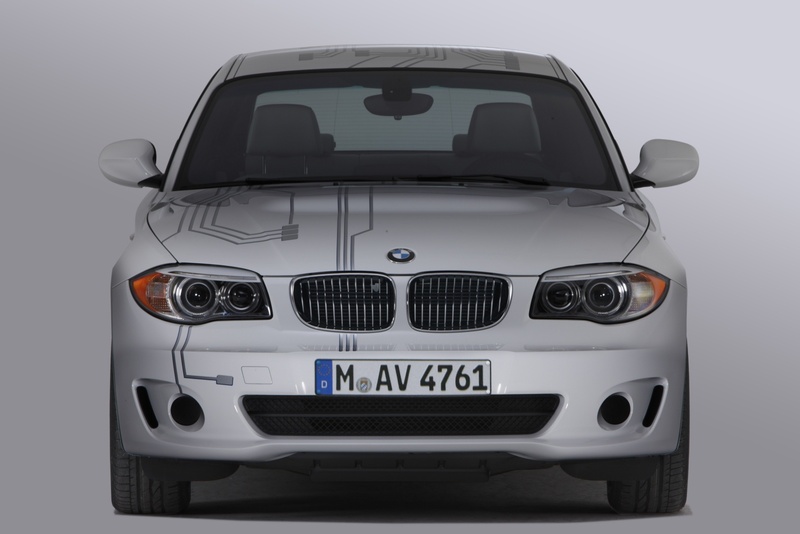 BMW ConnectedDrive assists in assessing field test results. 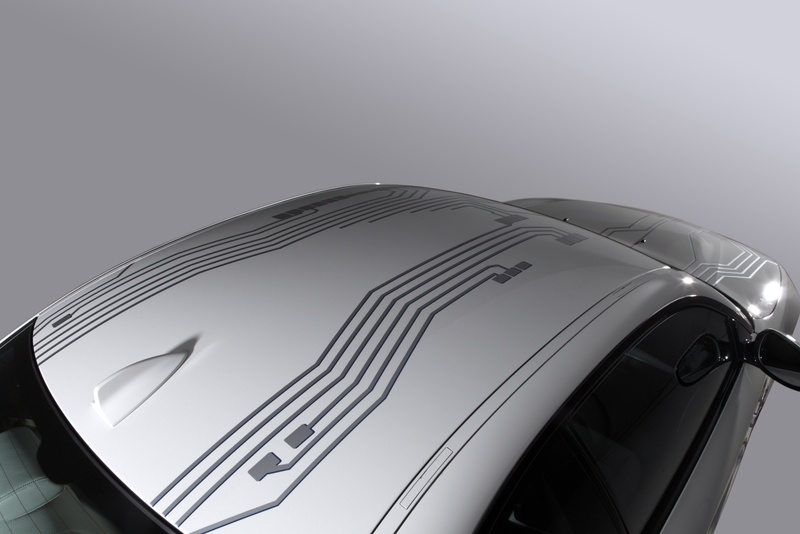 Access to the vehicle via BMW ConnectedDrive remote functions is also BMW’s feedback channel for the data recorded during field tests. 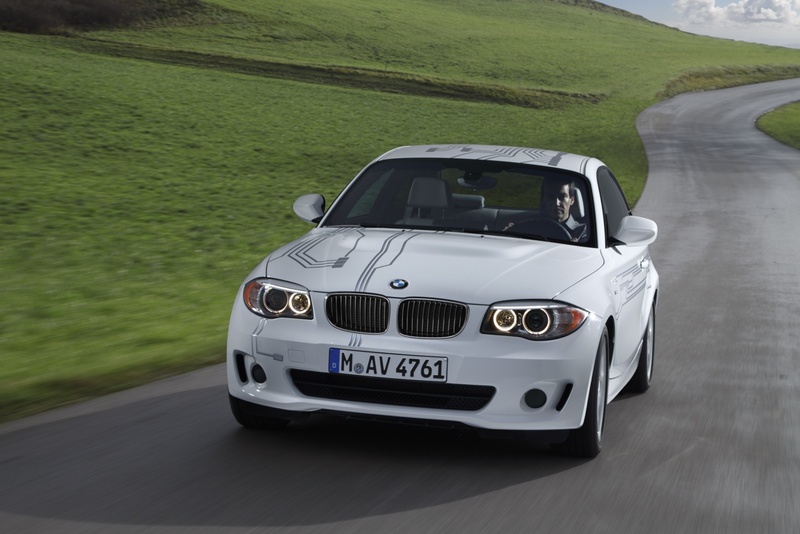 When the charging process has finished and/or when network connectivity is established, the vehicle sends the vehicle data history recorded during the previous five hours to the BMW Backend for further analysing. Here, only development-related data such as distance travelled, maximum vehicle ranges as well as charging times and behaviour is collected, transferred and allocated to each respective vehicle. The objective is a comprehensive vehicle-specific documentation in order to obtain knowledge that can be used for further development. Anonymity of recorded data is, of course, guaranteed at all times. With its powerful, sporty and elegant styling, supreme agility, luxurious functionality and innovative equipment features, the BMW X1 is a trailblazer in the premium compact segment in terms of driving pleasure. Yet again premium carmaker BMW has successfully transplanted the BMW X model concept to a new vehicle segment to create a unique product. Now the BMW X1 is breaking new ground, this time in terms of the BMW EfficientDynamics programme. The new BMW X1 xDrive28i is the brand’s first four-cylinder petrol model with BMW TwinPower Turbo technology to comprise High Precision Injection direct petrol injection, a charge system based on the Twin Scroll principle, double-VANOS variable camshaft timing and VALVETRONIC variable valve control. BMW has timed the introduction of this technology package in the new BMW X1 xDrive28i to coincide with the launch of a new generation of BMW 2.0-litre petrol engines. The new 180 kW/245 bhp power unit combines a power and torque upgrade over the previous engine with substantially reduced fuel consumption and emissions. This twofold improvement is reflected in some impressive performance specifications. The 0 to100 km/h sprint time is 6.1 seconds (automatic: 6.5 seconds), an improvement of 0.7 seconds (automatic: 0.3 seconds) over the previous model, which was only available as an automatic. At the same time, average fuel consumption in the EU test cycle has been cut by 16 per cent to 7.9 litres/100 km, with CO2 emissions of 183 grams per kilometre. 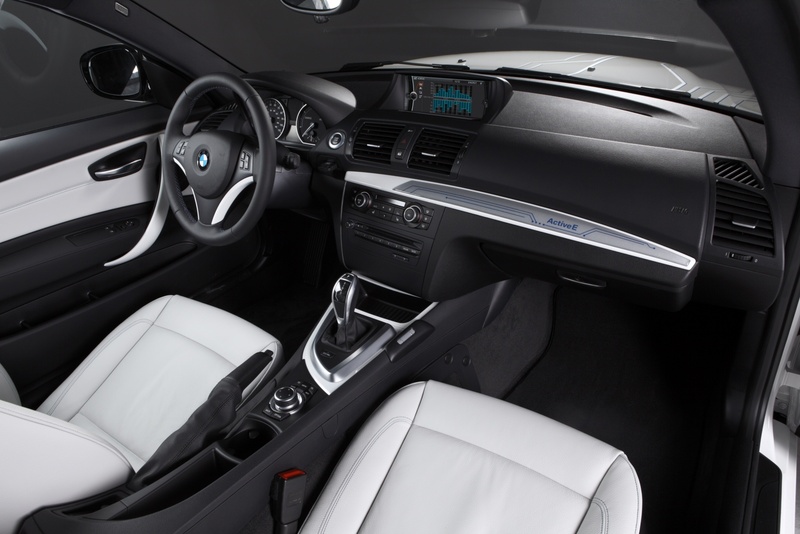 The new BMW X1 xDrive28i comes as standard with a six-speed manual transmission. The standard-fitted BMW EfficientDynamics technology includes – amongst other features – Brake Energy Regeneration, Gear Shift Indicator, the Auto Start-Stop function and on-demand control of auxiliary units. An optional eight-speed automatic version is also available. Thanks to its exceptionally high internal efficiency, models with this transmission offer identical fuel consumption and emissions performance to those with the manual version.